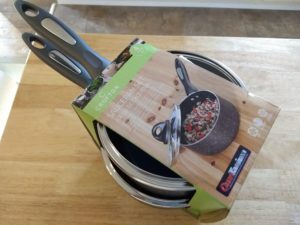 I’ve been needing some new saucepans, and Aldi often seems to have what I need when I need it, thanks to the store’s rotating stock of limited-time ALDI Finds (Special Buys). I picked up the Crofton Saucepan Set for $12.99 at the time of publication. Aldi’s ad called them Crofton Speckled Saucepans. The saucepan set comes with two saucepans, each with their own lids, making it a four-piece set. One saucepan is 1.5 quarts, and the other saucepan is 2 quarts. I wish the set came with a 3-quart saucepan, but, alas, it does not. The saucepans feature shatter-resistant glass lids, PFOA-Free nonstick material, and comfort-grip handles with heat resistance. The nonstick material on these pans is called QuanTanium, which is a registered trademark of Whitford. Whitford manufactures specialty, high-performance coatings in the automotive, energy, housewares, industrial bakeware, medical, and textiles industries. The saucepans made in China and are suitable for use on gas, electric, or glass ceramic ranges. The set comes with a short user manual with use and care instructions. Before using, it recommends hand washing in warm, soapy water with a dish cloth or soft sponge. Then rinse and dry. The saucepan should be used on a burner that is no larger than the bottom of the pan, and the pan should heat up gradually on the burner; do not put the pan on a pre-heated burner. The manual states heat settings of medium or lower will yield the best results, and avoiding high heat settings will preserve the nonstick surface. Also, it says to not overheat an empty saucepan, and make sure that oil, water, or food are in the saucepan before heating. The manual recommends using nylon, wood, or plastic tools to preserve the nonstick surface. Don’t use abrasive cleaning products such as steel wool, scouring pads, or abrasive cleaners. Hand washing is recommended. How are the saucepans regarding functionality? I used one of them immediately to prepare a boxed pasta salad mix from Aldi. The pasta salad instructions said to prepare it in a 3-quart saucepan, but the 2-quart saucepan from Aldi worked fine. When it was time to drain the cooked pasta, the saucepan handle was comfortable to hold and tilt. The pan also washed up easily afterward. These saucepans did not come with a warranty, and I’m uncertain how they will hold up over time. We once owned a skillet from Aldi that was one of the best we’ve ever owned, but we also own some fry pans from Aldi that developed chips on the edges of the nonstick surface after a few months. Check back for updates on how these saucepans perform after some use. 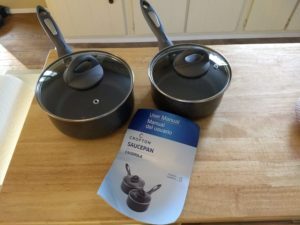 Aldi’s Crofton Saucepan Set is an ALDI Find (Special Buy) that includes a 1.5-quart saucepan with lid and a 2-quart saucepan with lid. The pans feature a QuanTanium nonstick surface that claims to be more durable than other nonstick surfaces or coatings. We’ll definitely be putting these two saucepans to the test in our kitchen, so come back later to see how the pans are holding up.